The anime pioneer Mitsuyo Seo (瀬尾 光世, 1911-2010) is best known in the English speaking world for his wartime propaganda films Momotarō’s Sea Eagles (1942) and Momotaro's Divine Sea Warriors (1945), but these films are just the tip of the iceberg in terms of Seo’s contributions to early animation history. 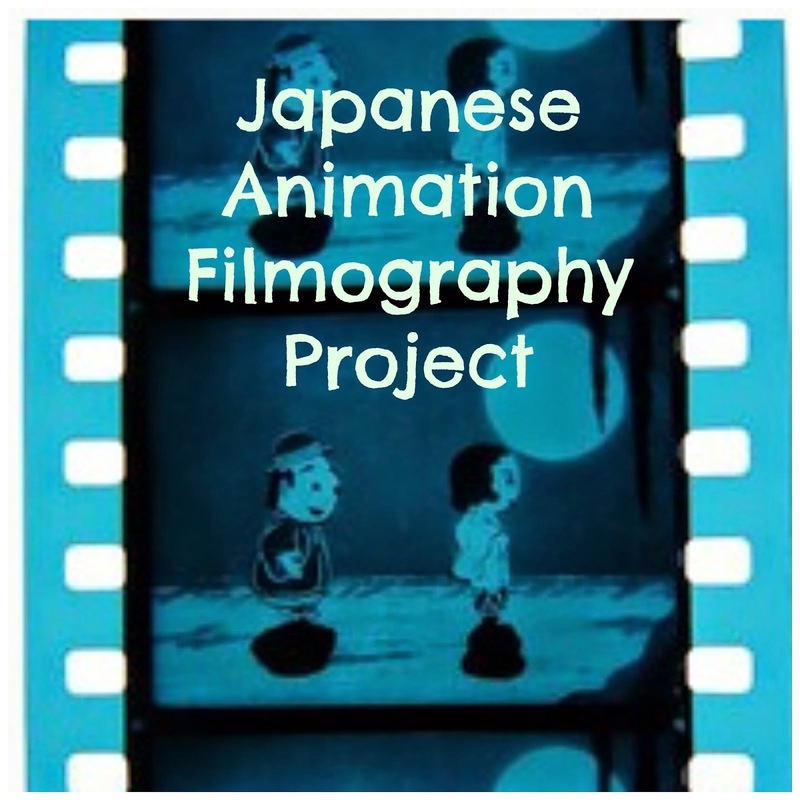 Ari-chan (アリチャン, 1941) tends to get only a passing reference in English guides to anime history as the first Japanese animation to use a multiplane camera for the entirety of the film, but little has been written in English about the style and content of this film. For Ari-chan, Mochinaga put his research into practice for the first time by designing, building, and using a four level multiplane camera. The project was funded by the Ministry of Education, who wanted a short film for children. The original scenario for Ari-chan was conceived by Mitsuyo Seo. According to Mochinaga’s posthumously published autobiography, he was interested in working on the film because of Seo’s description of the final scene: a field of cosmos flowers set against the moon in the background. These flowers had a personal meaning for Mochinaga because he had fond memories of playing in fields of cosmos when he was a child in Manchuria. Mochinaga felt that the best way to achieve this scene was by using a multiplane camera. Seo was won over by the idea, but he had some push back from the studio. In the end, Seo invested his own money in the venture so that Mochinaga would have creative control. 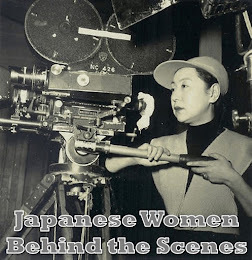 The production did not run smoothly however, because part way through the shoot GES merged with Asahi Kinema and they had to take the multiplane camera apart and move it to a new studio and reassemble it. Mochinaga also nearly ran out of the paper he was using for the watercolour backgrounds (see: Mochinaga). 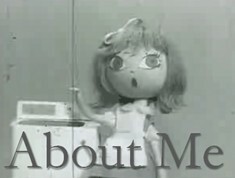 It is likely that Seo and Mochinaga were influenced by the Walt Disney Silly Symphony series for both the style and format of Ari-chan. Disney’s first use of the multiplane camera was in their Oscar award winning short The Old Mill (1937) – a film that many Japanese animators have cited as influential on them creatively. Just like the Silly Symphonies, Ari-chan pairs music and animation, is aimed at children, and uses anthropomorphic insects. 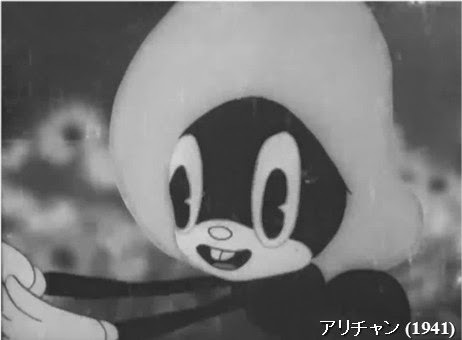 In fact, I was struck during the opening sequence of the obvious similarities between Ari-chan and Disney’s The Grasshopper and the Ants (Wilfred Jackson, 1934). 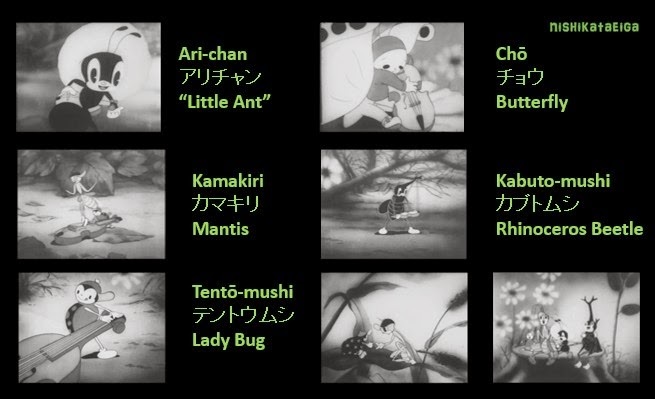 This Silly Symphony is based on the famous Aesop fable The Ant and the Grasshopper (note: for some strange reason this story is called The Ant and the Katydid アリとキリギリス in Japanese) about a lazy grasshopper who spends the summer months at play while the ants use the time to work hard to prepare for winter. As in The Grasshopper and the Ants, Ari-chan opens with a shot of the base of an enormous tree where ants are busy at work. 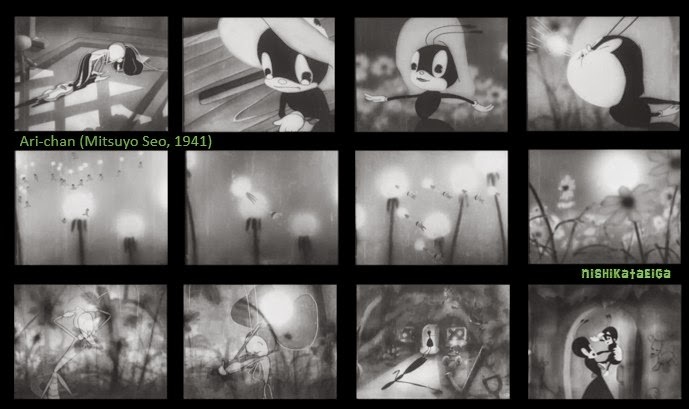 The film also features grasshoppers that play fiddles, and the usual pratfall humour of animated shorts, but that is where the story similarities end. Instead of being lazy, the grasshoppers in Ari-chan are depicted as dedicated musicians. 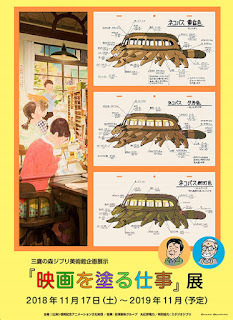 The story focusses on the title character Ari-chan, or “Little Ant”, a child ant not yet old enough to help the colony with their work. Ari-chan rolls up on his tricycle and tries to help the grown-ups, but when his efforts fail he goes off into the field of flowers to play. He blows the seeds off a dandelion and chases the parachuting seeds until he discovers a little garden with a sandbox of toys. A fiddle lying on the ground catches his eye and he decides to take it. Ari-chan runs through the flowers, playing the fiddle as he goes. Meanwhile, through a crosscut we see the owner of the fiddle discovering the theft and appearing distressed. Ari-chan is oblivious to the pain he has left in his wake and continues on his merry way until he discovers his friends at play. They also want to play with the fiddle, but Ari-chan shakes his head “no”. The butterfly offers him the sweet nectar of a flower, and this is all it takes to convince Ari-chan to share his treasure. The butterfly (chō) plays the fiddle beautifully, strumming it as if it were a harp. Next up are the mantis (kamakiri) and the ladybug (tentō-mushi), who play a more country style melody, with the mantis jumping on the strings and the ladybug playing on the fret. Finally, the rhinoceros beetle (kabuto-mushi) gives it a go, but his long horn comically gets in the way. He struggles to disengage himself, causing the fiddle to go flying and breaking its strings. Ari-chan tries desperately to repair the fiddle. The moon comes out, and the grasshopper orchestra begins to play its magical melody on a variety of string instruments (violins, violas, cellos). Inspired by this, Ari-chan plucks a blade of grass to try to play the fiddle in the same way. Just then, an ominous black shadow of a hand interrupts the proceedings. 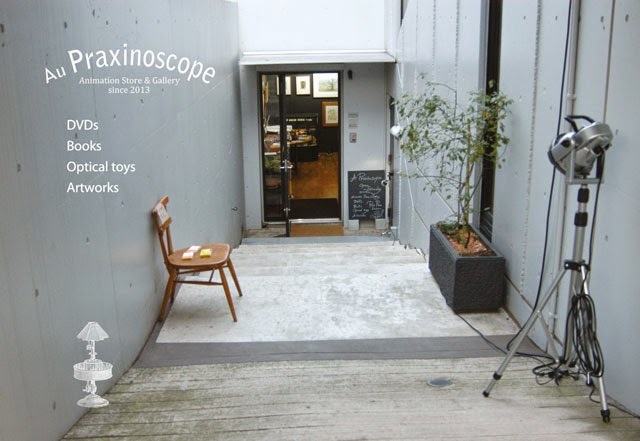 It is the hand of a small child trying to capture an insect for his bug cage. The insects run for their lives in a dramatic sequence. After a close call, Ari-chan climbs on the back of the grasshopper conductor and they escape together. The grasshopper conductor pats Ari-chan’s head then goes back to conducting. Ari-chan once again tries to join in, but suddenly realizes the value of the fiddle. In another dramatic sequence, he rushes back to the home where he found it and discovers the fiddle owner in tears. Without drawing attention to himself, he quietly slips the fiddle into the house and returns happily to playing with the dandelion seeds. The final sequence is a multilayered image of the orchestra playing superimposed with cosmos flowers and the moon. The young female grasshopper reunited with her instrument joins in. The film concludes with Ari-chan running home to his mother’s embrace. The score for Ari-chan was composed by Tadashi Hattori (服部正, 1908-2008). Hattori composed the scores for many films in the 1940s and 1950s including several by Akira Kurosawa (The Men Who Tread on the Tiger’s Tail, Those Who Make Tomorrow, No Regrets for Our Youth, and One Wonderful Sunday), as well as animated shorts by Seo’s mentor, Kenzō Masaoka (Tora-chan, the Abandoned Kitten, and Tora-chan and the Bride). Hattori stands out among other composers for his love of the mandolin, composing many pieces for mandolin orchestras (watch the Amedeo Mandolin Orchestra perform Hattori’s Italian Fantasy here). As a lover of string instruments, he was the ideal candidate to collaborate on the music. The music matches the screen action perfectly. 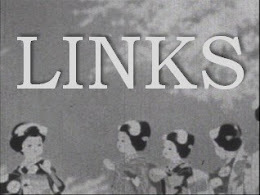 There was by 1941 already a tradition in Japan of pairing music with animation, dating back to the record talkies of the late 1920s / early 1930s, but this is the earliest animation that I have seen from Japan where the music has so perfectly been composed for the animation with music as a central theme to the plot. They have clearly made an effort to emulate the Disney style, and have done a brilliant job of it considering their technical limitations: no colour film stock, limited celluloid, and a very small crew. Like the early Disney films (Silly Symphonies, Snow White) Mochinaga did the backgrounds using watercolour on paper. Although Snow White (1937) predates Ari-chan, it is unlikely that Mochinaga and Seo would have seen it. Due to the war, Snow White was not distributed in Japan until 1950. It is certainly possible that they had read about the film and the techniques that it used. One obvious difference between the Disney style and this film is the use of cutouts for certain effects. To my knowledge, Disney did not use cutouts on the multiplane camera, just celluloid painted with acrylic and a watercolour background. 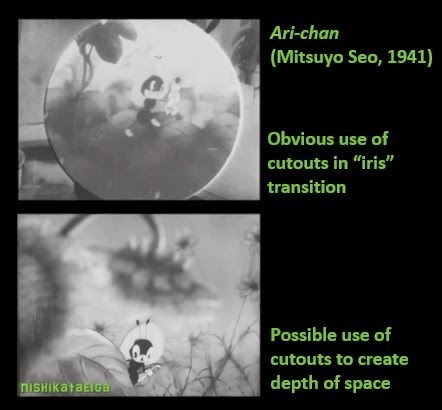 One of the most obvious uses of cutouts in Ari-chan is in the simulated “iris” transition done between Ari-chan discovering the fiddle and Ari-chan running through the flowers. In some of the garden scenes, the plants and flowers look too textured to have been merely drawn on cel. He also gives the image more depth in the final musical sequence by using superimposition. It seems likely given Mochinaga’s limited resources that he took whatever measures necessary to give each scene the look that he wanted. The result is an engaging short that would be absolutely stunning if digitally restored. The credits look as though they were written on a chalkboard then superimposed onto the film. 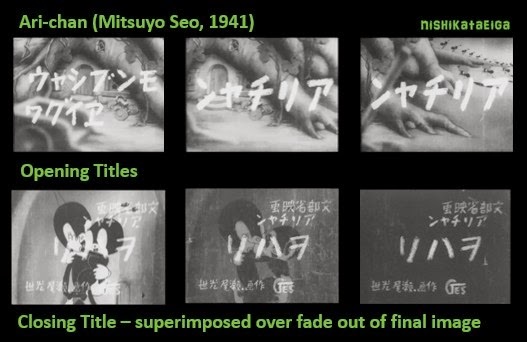 The opening and closing titles are mostly in katakana written left to right, with kanji used for the name of the director and the film’s sponsor (Monbushō Eiga). Reading horizontally from right to left has become rare in Japan, although you still see it on some signs like ramen restaurants and police car doors. Japanese these days is more commonly read/written vertically (top to bottom / right to left), or Western-style horizontally (right to left / top to bottom). The choice of katakana for the title indicates that the film was intended for children. Children’s literature today is usually written in hiragana, but in the 1930s they preferred katakana. The title also uses archaic katakana forms such as ヱ (ye), ヲ (wo), and ハ (ha) for “wa”. At the end of a Japanese animation it is common to see “Owari” (The End) written in various ways: おわり (hiragana), オワリ (katakana), or 終わり/ 終 (kanji). In Ari-chan they use an archaic form ヲハリ written right to left リハヲ. It took some time for my friend and colleague, Keiko Sasaki, and I to figure out that the first title card モンブシャウ　ヱイグワ reads Monbushō Eiga (文部省映画). The modern reader would pronounce it “Monbushau Yeiguwa”. The only place one sees “ye” ヱ regularly these days is the archaic form of Ebisu used by Yebisu Beer (ヱビスビール). The use of ウ to indicate a long vowel sound in katakana has been replaced by ー in modern Japanese. I don’t know why they use シャウ (shau) instead of シヨウ (shō) and グワ (guwa) instead of ガ (ga), but it is certainly fascinating how much Japanese has changed since the war. 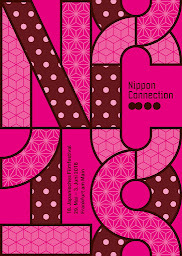 The film is in the archives of the NFC and appears on Disc 3 of the Japanese Art Animation Film Collection. Hu, Tze-Yue G. Frames of Anime: Culture and Image-Building. Hong Kong: Hong Kong UP, 2010. Mochinaga, Tadahito. Animēshon Nitchū kōryūki: Mochinaga Tadahito jiden. Tokyo: Tōhō Shoten, 2006. Ono, Kosei. “Tadahito Mochinaga: The Animator Who Lived in Two Worlds.” AWN. 4.9 (December 1999).